Airblast has a comprehensive range of open blasting machines available as either stand alone units or as complete systems. Each blast pot is manufactured to be fit for purpose and is supplied with region specific certification. All machines are designed to be used with a wide range of accessories including an extensive choice of nozzles, wet blast attachments, and internal pipe cleaning devices. Numerous metering valve options are available depending upon the application including Micro Valve, Flat Sand Valve, Steel Grit Valve, and Thompson Valve. A wide range of high production single or double chamber and multiple outlet machines are available, manufactured to cover all possible requirements of the industry. All equipment is designed to facilitate fast filling, unrestricted airflow, as well as easy access for inspection and maintenance. The portable range from 17 liters to 300 liters offers high quality construction, security and performance. 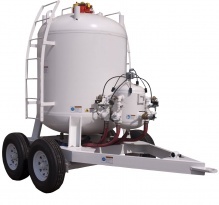 Airblast Bulk Blasting Systems are designed to supply up to eight blasters operating independently bulk blast systems are designed to be easily transported being supplied as either skid mount or on a yard trailer. As each blaster operates independently down time is minimized and production optimized. 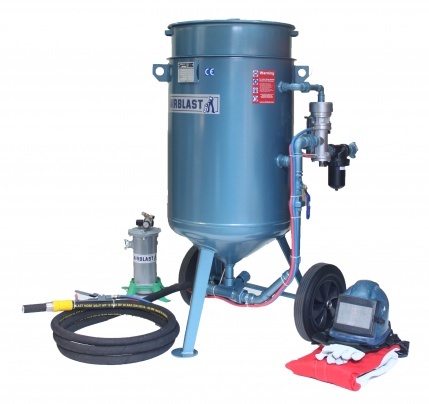 Airblast Bulk Blasting Systems are designed for large scale blasting jobs and can be used with the wide range of accessories including a wide choice of nozzles.